CRM Software Features and CRM Solutions - Customer Relationship Management Software - Database Systems Corp.
TELEMATION is a CRM software system that provides valuable information to service agents when they are assisting customers either on the phone or through other media. Telemation has a rich set of CRM software features plus includes a user friendly CRM development toolkit that empowers our customers with the ability to make their own customized changes to Telemation. Applications typically would include Contact Management, Help Desk, Customer Service, Fund Raising, and Catalog Sales to name only a few. The package also fits both B2B and B2C requirements. TELEMATION has the power and flexibility to manage virtually any phone operation no matter how large or small. And when installed with DSC's PACER call center phone system, or integrated with a customer's automated phone system, TELEMATION significantly improves the productivity of call center agents. TELEMATION CRM solutions also provide the ability for agents to work remotely via the internet just as they work at the local call center. See Remote Agent web page for more details. TELEMATION can be used by executives, market researchers, sales people, as well as customer service agents. TELEMATION was designed from the beginning to be customized yet still be easy to maintain. It's CRM software features include robust inbound and outbound campaigns that typically requires no changes to fulfill many call center requirements. Database Systems Corp. has prepared a 45 minute technical presentation of its Customer Relationship Management software product. This presentation can be easily downloaded by clicking the following link TELEMATION CRM Solutions. CTI option for inbound and outbound operations. Flexible script generation and prompting. Flexible and extensive system and agent statistics. Extensive standard and custom reports. Import/Export conversion between computer systems. Complete system and data security. Order entry and tracking system. TELEMATION manages both agent operations and call center development. The TELEMATION environment is highly flexible and designed to be customized - if needed. For example, users can create screens that prompt agents to follow a script and react to customer responses. As the customer answers each question, the agent checks the corresponding response on the screen. TELEMATION automatically pops the next screen with a new script and prompts. If literature is requested, TELEMATION generates a "picking list" along with a personalized cover letter and label. If a company has an automated phone system, TELEMATION can significantly improve the productivity of all agents. The CTI option is a link between TELEMATION and the supported telephone systems. This powerful feature streamlines inbound and outbound call handling for any call center. Inbound call features include automatic screen pops and agent skill-set routing. Outbound calling features enhance production by eliminating manual dialing. The Call Blending feature of inbound and outbound campaigns can minimize staffing requirements. In summary, automating a call center telephone functions increases the center's capacity while producing tremendous savings. DNIS: TELEMATION routes a call to the appropriate campaign and next available and qualified agent based upon the number dialed. ANI: TELEMATION automatically locates and displays the incoming caller's information as the call is assigned to the next available agent. Preview Dialing: As the name implies, the agent previews the contact information prior to dialing. The agent initiates outbound dialing by pressing a function key. Preview dialing is convenient and cost-effective and generally used when the agent is familiar with the person to be called. Business-to-business calling generally uses this form of dialing. Progressive Dialing: This method is similar to Preview Dialing; however, the call is launched automatically by the system after a predetermined amount of time. A predefined queue of calls is generally used with this form of dialing. Combining record preview and automatic call launch promotes high quality calls with increased production. Predictive Dialing: This is sometimes referred to as Anticipatory or Adaptive Dialing. Predictive Dialing uses a computer generated call list as the source of numbers to be dialed. 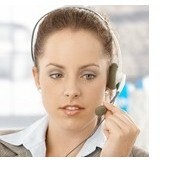 Calls are filtered to eliminate no answer, line busy, answering machine and other non-productive calls. The filtered calls are passed to available agents. TELEMATION uses wrap-up time, nuisance rate, idle time, list quality (i.e., connect rate) and a user defined throttle to statistically adjust call launching. Predictive Dialing is generally used for business-to-consumer calling campaigns where reducing non-productive calls increases the contact rate. List Management is a vital feature ofcall center software.It is especially useful for Predictive Dialing queue management support. TELEMATION provides this powerful tool for organizing lists of consumer or business contacts. Tailoring TELEMATION to specific Company needs does not require a staff of programmers. Instead, Telemation was designed to be modified by non programmers. Users can modify TELEMATION to give any call center the look and feel it requires, and yet be easily supported by DSC. Included in the development option are the components: TRANSACT, a menu, screen and file definition system; TRANSWRITER, a report and display writing system; FASTPlus, a high performance file access system; EZTRAN, an easy to use logic and flow control language. With these tools users can add custom modules to TELEMATION or develop new applications. For more information see Net Work Development Kit. TELEMATION provides the agent with a wide range of functions to effectively manage a large customer/prospect base. Each prospect can be easily accessed. If the specific customer name or number is known, the agent can enter this information on the screen and the customer data will be quickly displayed. Any other criteria can be used to locate the correct customer information. The agent can view the prospect file through several different display screens. The SOUNDEX utility can help the agent locate a customer through a "sounds-like" locator. Users can develop and administer more than one marketing campaign at a time. This is useful when different groups of agents are contacting different customers or prospects at the same time. Thus, marketing may be engaged in a new sales campaign while customer service is handling support questions and finance is calling on past due accounts. Each campaign may use its own database or share the same company or contact information. The Appointment Scheduling module is included to help the agent schedule calls or visits for a sales organization. The agent may view each sales representative's upcoming calendar to eliminate schedule conflicts. TELEMATION automatically handles holidays and vacation days, as well as event scheduling such as seminars. Agents can retrieve groups of customers through its call-queuing mechanism. Customers may be assigned follow-up dates and times, and the agent may select one of several methods to create a queue of customers to be serviced or contacted during the day. Custom follow-up methods can also be implemented within TELEMATION to fit many specific needs. Any number of follow-up dates may be managed by TELEMATION. This allows different groups within the same organization to contact customers at different times for various reasons. This feature automatically compensates for holidays and weekends based upon custom parameters. A powerful and useful function of TELEMATION is the automatic contact history feature. It provides useful information about a customer's previous contacts. Call History can be recorded for virtually any activity performed by the agent. One of the key activities an agent performs is the distribution of literature to a prospect. TELEMATION includes complete literature fulfillment. The system automatically generates a "pick list" of requested brochures or pamphlets, and prints a personalized cover letter and a mailing label with the prospect's name and address. Another feature of TELEMATION is the Mass Mail system. Similar to the literature processing for an individual prospect, this function lets the agent identify prospects to receive a literature packet. Prospects can be selected using any criteria. One of the most comprehensive functions of TELEMATION is its scripting capability. Using a predefined script, the agent recites sales presentations and product descriptions, or narrates questions for surveys. Scripts are easily created and maintained under TELEMATION. Users build simple to complex scripts merely by filling in the blanks and entering text on the screen. Scripts can be created and "locked-in" for a specific campaign. There is no limit to the number of scripts. A standard feature of TELEMATION is an extensive Help system that allows agents to view relevant data at the touch of a key. Agents can view information on customers, prospects, orders, complaints, schedules, and other useful data. Statistics are critical to most call centers, especially if the agent is compensated based upon sales performance. TELEMATION monitors agent performance and provides accurate statistics reporting. With TELEMATION, users can track virtually every keystroke entered by the agent. Reports are generated from a statistics journal that shows the average phone calls per hour, length of calls, number of successful calls, orders received and much more. One of the most flexible components of TELEMATION is the reporting system. Users can produce accurate, timely, and meaningful reports from large volumes of data. TELEMATION already includes many standard reports users typically require. Reports can also be generated via ad hoc methods. TRANSWRITER gives even greater control over the reporting process. Users can tailor standard reports or create new reports in just minutes. These reports can be installed under TELEMATION and may be executed at the touch of a key. Many call centers obtain prospect data, such as mailing lists, from outside computer sources. With TELEMATION, users can easily convert data from other systems. Likewise, users can export information from TELEMATION to other systems. No more hassles getting data in and out of this system! Users can provide data to other departments or companies in formats that match their systems import/export requirements. This utility lets users monitor the activities of agents as they perform specific tasks. This feature is independent of terminal type and can be used from any station or from a remote location with dial-up. Individual statistics on each agent and task can be kept and reported in detail. TELEMATION provides critical security against unauthorized access. All functions and data files can be protected. Users control access by assigning security privileges to agents. The security codes grant or deny access according to assigned security levels. Before entering TELEMATION, each agent must enter a valid user ID and password. Once validated, the agent is granted access to only those functions permitted within the prescribed security level. Users can also assign TELEMATION screens a privilege level. Thus, screens with sensitive data can be accessed only by agents with the appropriate privilege. An option to TELEMATION lets users capture and track orders. Multiple order entry systems may be defined for each installation. DATABASE SYSTEMS offers a wide range of software systems. They include productivity tools as well as complete support systems. See Net Work Development Kit ( NDK ) for more information. Contact DSC to learn more about our customer relationship management and crm software technology.